Alejandro Arce displays some of the strains of marijuana for sale at Marpole-based dispensary Erbachay Health Centers. Photo by Emelie Peacock. 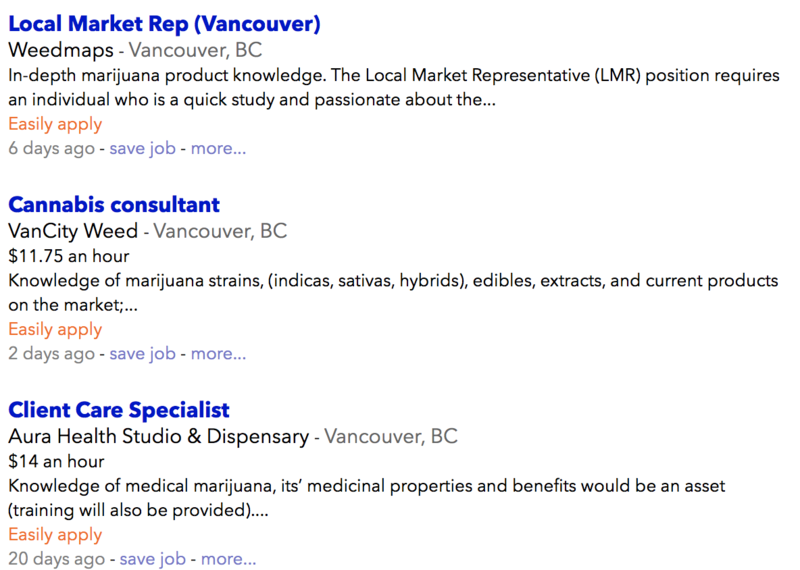 The medical marijuana industry is actively hiring all types of professionals, yet stigma and a lack of legal clarity may lead some to pass up these opportunities. As students graduate and look for work, the local cannabis industry is hiring client care specialists, marketers, writers, nurses, business managers and entrepreneurs. While the jobs are there, most dispensaries operate in a precarious existence and are often unlicensed. Legal uncertainty, along with stigma, may prevent some from entering the industry. Marijuana is becoming more commonly accepted to speak about at universities, yet Alejandro Arce said stigma still exists for people trying to enter this growing field. Arce, an employee at Marpole-based dispensary Erbachay Health Centers who also organizes a Meetup group for cannabis professionals, sees potential for many types of professions within the field. “If you can have a bit of the fortitude and long- term vision, this industry is going to need accountants, marketers and lawyers,” Arce said. Madeleine Robichaud, Langara College environmental geography student also said it is normalizing and with so much money in the industry, she likened it to the Silicon Valley tech boom. While there were no representatives from the cannabis industry at Langara College’s March 13-17 Co-op & Career Week, organizers were not opposed to these companies advertising to students as long as they were legal. Arce said if the industry continues to grow at the pace it is now, and is fully legalized this year, there are long-term benefits to working in the industry.